Wintersweet – Dig Delve – An online magazine about gardens, landscape, growing & making. I first encountered wintersweet on a memorable day in the long overgrown wilderness of my childhood garden. Miss Joy, the maker of that acre which had finally overwhelmed her, had clearly been quite a plantswoman and we unearthed many hidden treasures as we cleared forty years of neglect. We had found a colony of trillium surviving in the leaf mould beneath a fallen amelanchier and scarlet peonies pushing through a glade of dim nettle. On this still winter’s day we discovered the wintersweet. We were slowly freeing the orchard of bramble to make a clearing. The source of a spicy and pervasive perfume eluded us while we worked but, as we cleared deeper into the thicket, we became aware of its origin. Scent triggers the strongest memories and I remember quite clearly the cut and the pull and getting closer to the prize as we tore at the thicket that surrounded and mounted the limbs of the mysterious shrub. Being the most nimble, and with the light of the day failing, the last few feet required a contortion to reach an accessible limb and pull a twig of flowers, which were hardly visible in the half-light, pallid and speckled on the gaunt branches. I know the smell in an instant now, but then its strength on the cool air was intoxicating for the discovery of something new. Later, in the heat of the kitchen, the perfume from this single twig filled the entire room. 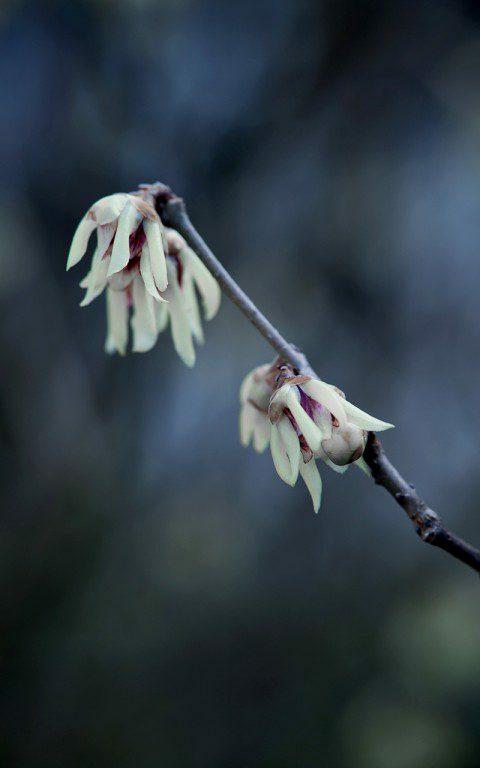 Geraldine, our neighbour and my gardening friend from across the lane, shared in the excitement and identified it as Chimonanthus praecox. We studied the waxiness of the translucent blooms. Starry, but cupped like an open hand with fingers facing forward, a second layer revealed an inner boss of petals stained plum-red. 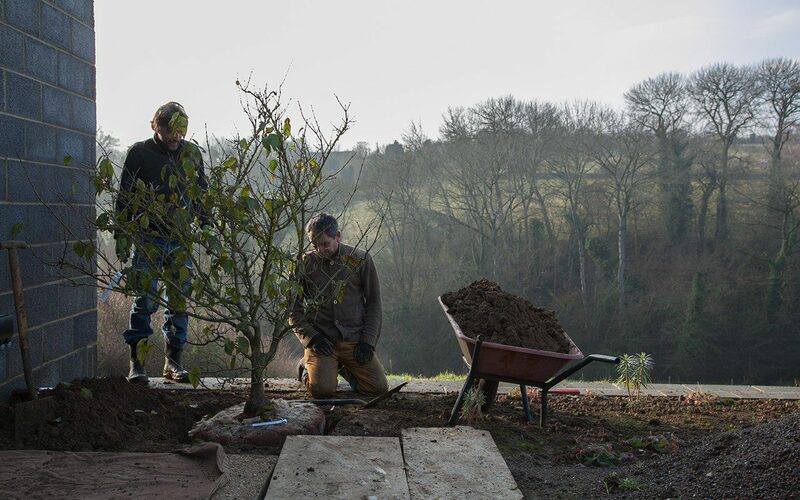 Until recently I have not had the place to plant one for myself, so I have gone out of my way to find wintersweet a home in clients’ gardens in the knowledge that they too will reap the rewards in January and February. This vicarious pleasure has been lived out fully at a project I am working on in Shanghai where I have designed a series of gardens that seat a number of restored Ming and Qing dynasty merchant’s houses within a forest of ancient camphor trees. 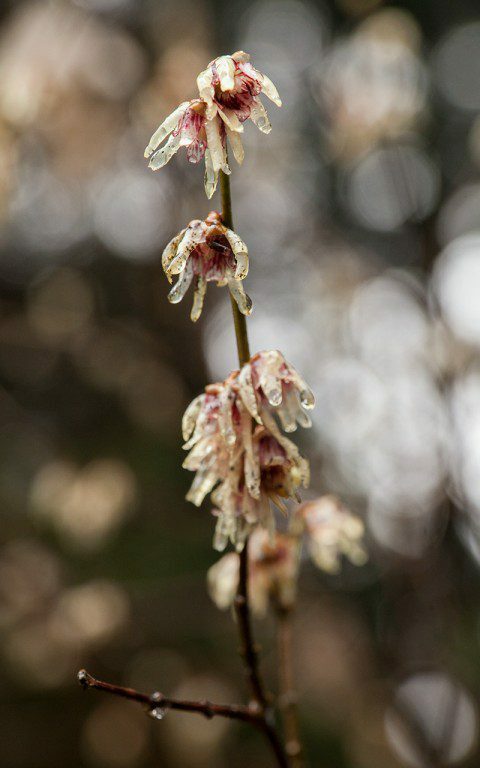 In the process of understanding how to interpret the planting, my research into Chinese gardens revealed that wintersweet was one of the natives used repeatedly in the pared-back palette of auspicious plants. The winter perfume was revered and the dried flowers were used to scent linen much as we use lavender here. Come the summer the long, lime green leaves are also scented when crushed. 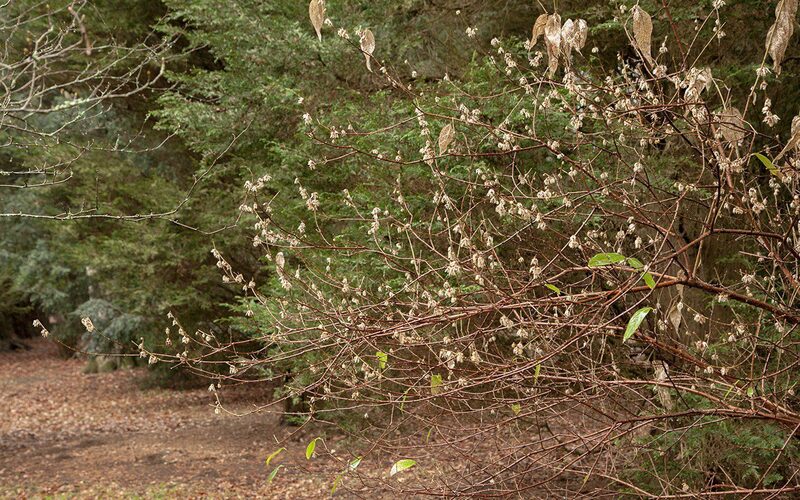 I have used them throughout the site as free-standing shrubs, placed close to the junction of paths where you are already pausing, but are then halted by the surprise of perfume. 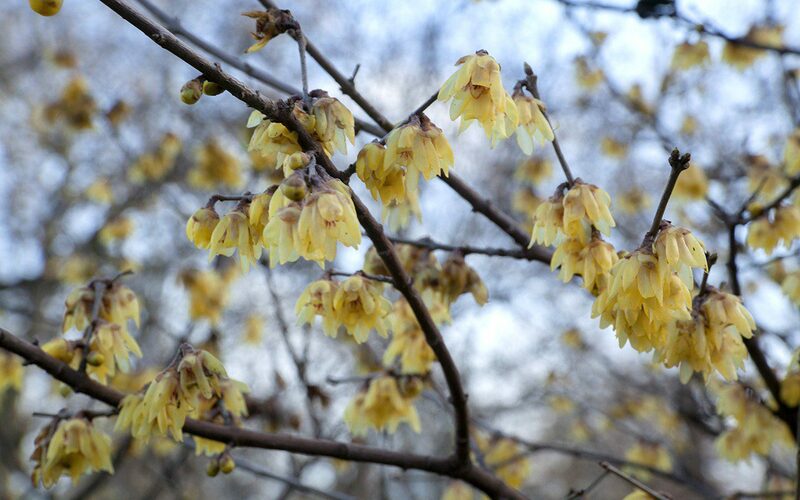 In its native habitat in open woodland Chimonanthus praecox can grow to as much as thirteen metres. In cultivation it forms a nicely branched shrub of three by three metres and, being well-behaved, it has been a mainstay of Chinese gardens for more than 1000 years. It was first introduced to Japan in the late 17th century as a garden plant and then to Britain a century later, arriving at Croome Court in 1766. If you read up about it, books repeatedly state that it needs the radiated heat of a south or west wall to ripen its wood sufficiently to flower well. The half-radius of Lutyens’ Rotunda at Hestercombe House, where Gertrude Jekyll’s original planting of 1904 still survives, beautifully demonstrates its use as a wall-trained shrub. Indeed, you see it flowering most prolifically on the hottest part of the wall. As it is hardy to -10°C it is happy out in the open and I have found it to be far more adaptable in this country where not too far north. The specimen at Westonbirt Arboretum, for instance, is flowering well in open woodland, so it is worth breaking the rules if you dare. Grown from seed wintersweet can take up to fifteen years to flower, a containerised plant five or eight after planting, much like a wisteria. As a species Chimonanthus praecox is variable, but there are a small number of named forms commercially available. In the Winter Garden I designed at Battersea Park (main image) I have used C. p. ‘Luteus’ as a perfumed welcome by the Sun Gate at the garden’s entrance to draw people in. I am not completely sure the plant supplied is the real ‘Luteus’. Although the flowers register a strong beeswax yellow they have a very slight staining to the central boss, which ‘Luteus’ is not supposed to have. ‘Sunburst’ is yellower still, whilst C. p. ‘Grandiflorus’ has a larger, more open flower which is paler and more translucent. A red stain suffusing the central boss is more typical of the species, which is also reputed to be more heavily scented than the above selections, although I’ve never been able to compare them. 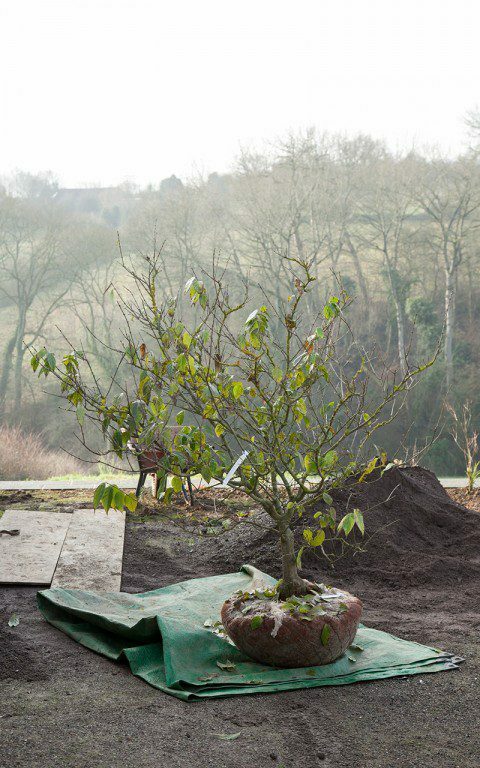 As I have waited this long to be able to plant one for myself and am impatient for flower, I went to Karan Junker for a mature, field-grown specimen. Her seed came to her via Roy Lancaster from a batch originally selected by the great Japanese botanist and plant collector Mikinori Ogisu. There is a fabled pinky-red clone in Japan and the seed potentially included these genes. Just before Christmas I planted my ten-year-old by the studio door so that the perfume is not wasted and today it has broken the first of a half dozen buds to reveal a form that is clear waxy yellow. There are no dark markings, but the scent – my February fix and instant reminder of my childhood discovery – is bewitching. 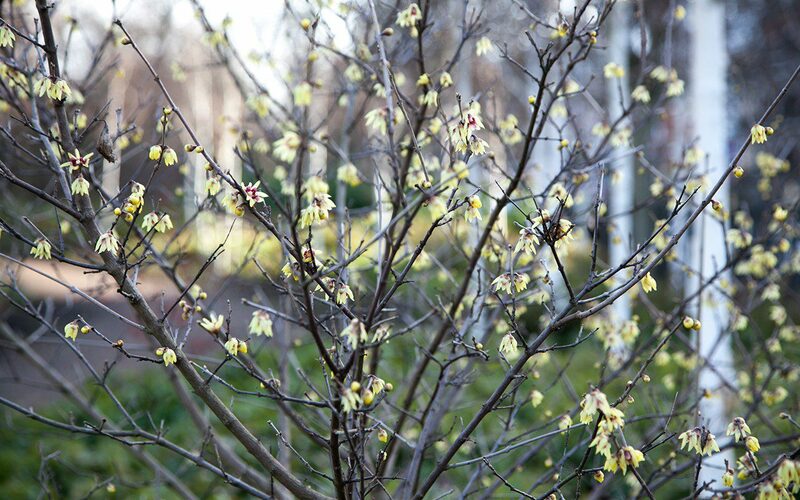 A winter without wintersweet would be a duller season, unmarked by this strange, scented treasure.